DIE Veneris, videlicet, 6 die Maii. Message from the H. C. that Daniel O'Neal has escaped out of The Tower. Order to the Lord Admiral to search for him. Order to the Lord Chief Justice to search for him. Like Order to the Justices and Sheriffs. Order for apprehending O'Neal's Man. Order to the Lord Warden of the Cinque Ports to apprehend O'Neal. The Marquis of Hertford's Letter concerning the Prince. To be communicated to the H. C.
Committee to consider about the Prince's Stay in this Country. Message to the H. C. for a Conference about it. Message from the H. C. with an Order for issuing Ten Thousand Pounds for Ireland; and for the Ten Ships in the River to be ordered to Sea. The Order for Ten Thousand Pounds for Ireland. Answer to the H. C.
Sir Edward Herne, Sheriff of Lincoln, Leave to come to Town. Bishop of Bath and Wells bailed. Bishop of St. Asaph bailed. The Bishops released upon their Bail. Answer from the H. C. for the Conference about the Prince's Stay in the Kingdom. To let their Lordships know, that the House of Commons are informed, that Daniell O'Neale, committed Prisoner by this House to The Tower of London, upon an Accusation of High Treason brought up against him from the House of Commons, is escaped out of The Tower, and fled: Therefore the House of Commons desires that this House would take some speedy Course for his Apprehension; and that it may be declared, That whosoever shall abet him and aid him, and not make Discovery of him, shall be liable to such Punishments as by the Law can be inflicted upon them; and that a Reward shall be given to them that shall apprehend him. "Ordered, by the Lords assembled in Parliament, That the Lord High Admiral of England is hereby required to give speedy Commands, That Search shall be made, in all the Ports of England, for the taking and apprehending of Daniell O' Neale, being of a sanguine Complexion, of a middle Stature, light brown Hair, about the Age of Thirty Years, little or no Beard, and of late hath been sick, who hath escaped out of The Tower of London, and stands charged of High Treason by the House of Commons; and that therefore whosoever shall abet and aid him, and not make Discovery of him, knowing where he is, shall be liable to such Punishments as by the Law can be inflicted upon him; and that a Reward shall be given to such as shall apprehend him. "To the Right Honourable the Lord High Admiral of England." "Ordered, by the Lords in Parliament assembled, That the Lord Chief Justice of the King's Bench shall speedily issue forth Warrants, That a diligent and private Search may be made, for the apprehending of Daniell O'Neale, being of a sanguine Complexion, of a middle Stature, light Brown Hair, about the Age of Thirty Years, little or no Beard, and of late hath been sick, who hath escaped out of The Tower of London, and stands charged of High Treason by the House of Commons; and that therefore whosoever shall abet and aid him, and not make Discovery of him, knowing where he is, shall be liable to such Punishments as by the Law can be inflicted upon him; and that a Reward shall be given to such as shall apprehend him." "Ordered, by the Lords in Parliament assembled, That speedy and diligent Search shall be made for the taking and apprehending of Daniell O'Neale, being of a sanguine Complexion, etc. as in the former Orders. 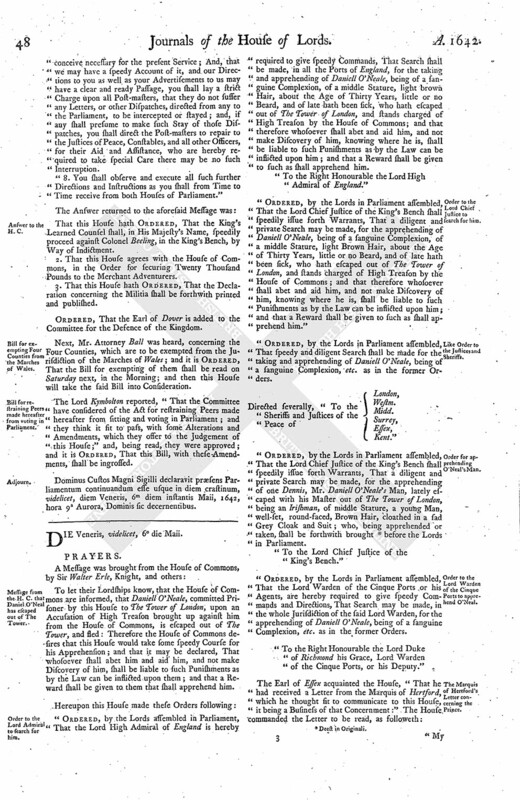 "Ordered, by the Lords in Parliament assembled, That the Lord Chief Justice of the King's Bench shall speedily issue forth Warrants, That a diligent and private Search may be made, for the apprehending of one Dennis, Mr. Daniell O'Neale's Man, lately escaped with his Master out of The Tower of London, being an Irishman, of middle Stature, a young Man, well-set, round-faced, Brown Hair, cloathed in a sad Grey Cloak and Suit; who, being apprehended or taken, shall be forthwith brought (fn. 1) before the Lords in Parliament. "To the Lord Chief Justice of the King's Bench." 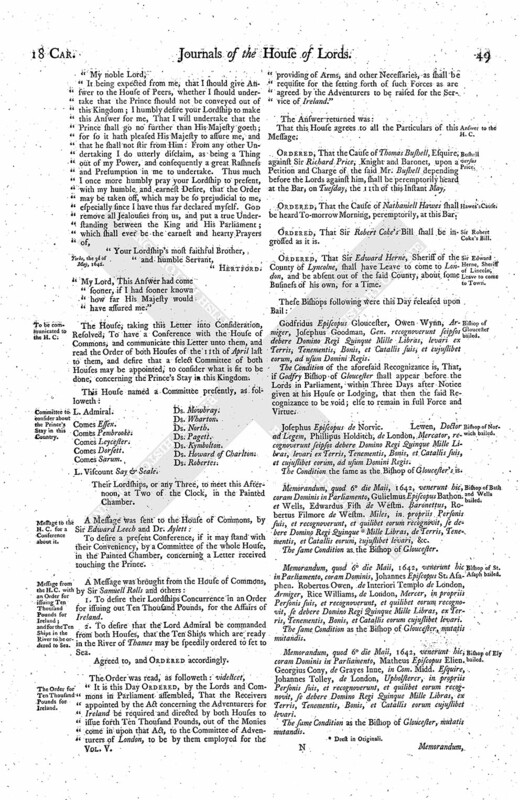 "Ordered, by the Lords in Parliament assembled, That the Lord Warden of the Cinque Ports or his Agents, are hereby required to give speedy Commands and Directions, That Search may be made, in the whole Jurisdiction of the said Lord Warden, for the apprehending of Daniell O'Neale, being of a sanguine Complexion, etc. as in the former Orders. "To the Right Honourable the Lord Duke of Richmond his Grace, Lord Warden of the Cinque Ports, or his Deputy." Yorke, the 3d of May, 1642. "My Lord, This Answer had come sooner, if I had sooner known how far His Majesty would have assured me." The House, taking this Letter into Consideration, Resolved, To have a Conference with the House of Commons, and communicate this Letter unto them, and read the Order of both Houses of the 11th of April last to them, and desire that a select Committee of both Houses may be appointed, to consider what is fit to be done, concerning the Prince's Stay in this Kingdom. L. Viscount Say & Seale. Ds. Mowbray. Their Lordships, or any Three, to meet this Afternoon, at Two of the Clock, in the Painted Chamber. To desire a present Conference, if it may stand with their Conveniency, by a Committee of the whole House, in the Painted Chamber, concerning a Letter received touching the Prince. 1. To desire their Lordships Concurrence in an Order for issuing out Ten Thousand Pounds, for the Affairs of Ireland. 2. To desire that the Lord Admiral be commanded from both Houses, that the Ten Ships which are ready in the River of Thames may be speedily ordered to set to Sea. Agreed to, and Ordered accordingly. 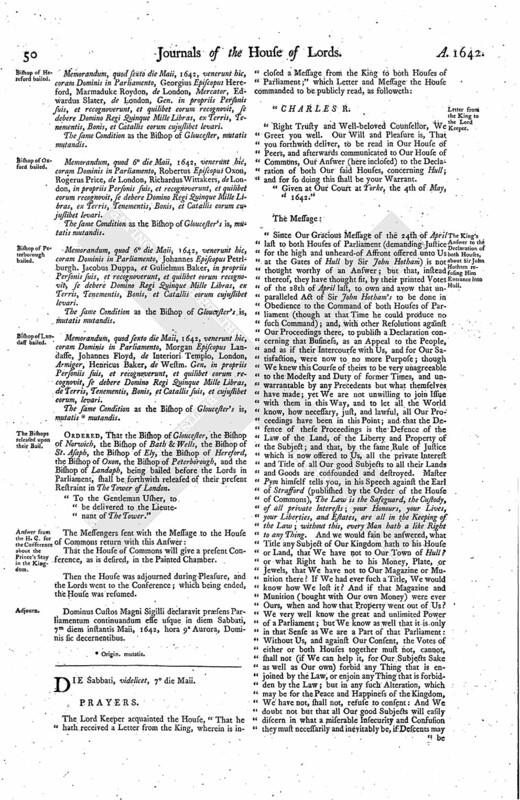 "It is this Day Ordered, by the Lords and Commons in Parliament assembled, That the Receivers appointed by the Act concerning the Adventurers for Ireland be required and directed by both Houses to issue forth Ten Thousand Pounds, out of the Monies come in upon that Act, to the Committee of Adventurers of London, to be by them employed for the providing of Arms, and other Necessaries, as shall be requisite for the setting forth of such Forces as are agreed by the Adventurers to be raised for the Service of Ireland." That this House agrees to all the Particulars of this Message. Ordered, That the Cause of Thomas Bushell, Esquire, against Sir Richard Price, Knight and Baronet, upon a Petition and Charge of the said Mr. Bushell depending before the Lords against him, shall be peremptorily heard at the Bar, on Tuesday, the 11th of this Instant May. Ordered, That the Cause of Nathaniell Hawes shall be heard To-morrow Morning, peremptorily, at this Bar. Ordered, That Sir Robert Coke's Bill shall be ingrossed as it is. Ordered, That Sir Edward Herne, Sheriff of the County of Lyncolne, shall have Leave to come to London, and be absent out of the said County, about some Business of his own, for a Time. Godfridus Episcopus Gloucester, Owen Wynn, Armiger, Josephus Goodman, Gen. recognoverunt seipsos debere Domino Regi Quinque Mille Libras, levari ex Terris, Tenementis, Bonis, et Catallis suis, et cujuslibet eorum, ad usum Domini Regis. The Condition of the aforesaid Recognizance is, That, if Godfry Bishop of Gloucester shall appear before the Lords in Parliament, within Three Days after Notice given at his House or Lodging, that then the said Recognizance to be void; else to remain in full Force and Virtue. Josephus Episcopus de Norvic. Lewen, Doctor ad Legem, Phillipus Holditch, de London, Mercator, recognoverunt seipsos debere Domino Regi Quinque Mille Libras, levari ex Terris, Tenementis, Bonis, et Catallis suis, et cujuslibet eorum, ad usum Domini Regis. The Condition the same as the Bishop of Gloucester's is. Memorandum, quod 6 die Maii, 1642, venerunt hic, coram Dominis in Parliamento, Gulielmus Episcopus Bathon. et Wells, Edwardus Fish de Westm. Baronettus, Robertus Filmore de Westm. Miles, in propriis Personis suis, et recognoverunt, et quilibet eorum recognovit, se debere Domino Regi Quinque (fn. 2) Mille Libras, de Terris, Tenementis, et Catallis eorum, cujuslibet levari, &c.
The same Condition as the Bishop of Gloucester. Memorandum, quod 6 die Maii, 1642, venerunt hic in Parliamento, coram Dominis, Johannes Episcopus St. Asaphen. Robertus Owen, de Interiori Templo de London, Armiger, Rice Williams, de London, Mercer, in propriis Personis suis, et recognoverunt, et quilibet eorum recognovit, se debere Domino Regi Quinque Mille Libras, ex Terris, Tenementis, Bonis, et Catallis eorum cujuslibet levari. The same Condition as the Bishop of Gloucester, mutatis mutandis. Memorandum, quod 6 die Maii, 1642, venerunt hic, coram Dominis in Parliamento, Matheus Episcopus Elien. Georgius Cony, de Grayes Inne, in Com. Midd. Esquire, Johannes Tolley, de London, Upholsterer, in propriis Personis suis, et recognoverunt, et quilibet eorum recognovit, se debere Domino Regi Quinque Mille Libras, ex Terris, Tenementis, Bonis, et Catallis eorum cujuslibet levari. Memorandum, quod sexto die Maii, 1642, venerunt hic, coram Dominis in Parliamento, Georgius Episcopus Hereford, Marmaduke Roydon, de London, Mercator, Edwardus Slater, de London, Gen. in propriis Personis suis, et recognoverunt, et quilibet eorum recognovit, se debere Domino Regi Quinque Mille Libras, ex Terris, Tenementis, Bonis, et Catallis eorum cujuslibet levari. Memorandum, quod 6 die Maii, 1642, venerunt hic, coram Dominis in Parliamento, Robertus Episcopus Oxon, Rogerus Price, de London, Richardus Wittakers, de London, in propriis Personis suis, et recognoverunt, et quilibet eorum recognovit, se debere Domino Regi Quinque Mille Libras, ex Terris, Tenementis, Bonis, et Catallis eorum cujuslibet levari. The same Condition as the Bishop of Gloucester's is, mutatis mutandis. Memorandum, quod 6 die Maii, 1642, venerunt hic, coram Dominis in Parliamento, Johannes Episcopus Petriburgh. Jacobus Duppa, et Gulielmus Baker, in propriis Personis suis, et recognoverunt, et quilibet eorum recognovit, se debere Domino Regi Quinque Mille Libras, ex Terris, Tenementis, Bonis, et Catallis eorum cujuslibet levari. Memorandum, quod sexto die Maii, 1642, venerunt hic, coram Dominis in Parliamento, Morgan Episcopus Landaffe, Johannes Floyd, de Interiori Templo, London, Armiger, Henricus Baker, de Westm. Gen. in propriis Personiis suis, et recognoverunt, et quilibet eorum recognovit, se debere Domino Regi Quinque Mille Libras, de Terris, Tenementis, Bonis, et Catallis suis, et cujuslibet eorum, levari. The same Condition as the Bishop of Gloucester's is, mutatis (fn. 3) mutandis. Ordered, That the Bishop of Gloucester, the Bishop of Norwich, the Bishop of Bath & Wells, the Bishop of St. Asaph, the Bishop of Ely, the Bishop of Hereford, the Bishop of Oxon, the Bishop of Peterborough, and the Bishop of Landaph, being bailed before the Lords in Parliament, shall be forthwith released of their present Restraint in The Tower of London. "To the Gentleman Usher, to be delivered to the Lieutenant of The Tower." That the House of Commons will give a present Conference, as is desired, in the Painted Chamber. Then the House was adjourned during Pleasure, and the Lords went to the Conference; which being ended, the House was resumed. Dominus Custos Magni Sigilli declaravit præsens Parliamentum continuandum esse usque in diem Sabbati, 7m diem instantis Maii, 1642, hora 9a Aurora, Dominis sic decernentibus.